This project has been a long time in the making – mainly because I don’t actually live in Milton Keynes anymore (to take any more photographs) but also because life is busy. So, I am sorry to the people that I intrigued way back in March (?!) with this idea and then wasn’t too quick about pursuing it. I haven’t always been the biggest appreciator of Milton Keynes, my hometown and where I have lived almost all of my life, up until this point. Particularly when I was living in Cornwall, studying for a degree in Graphic Design at University College Falmouth, I found it hard to think of my hometown fondly (excluding my family and cat of course!). But let’s face it, it is hard to appreciate anywhere half as much when you live in Cornwall. However, upon returning to Milton Keynes when I finished my degree in July 2012 – it’s also really hard to get start a graphic design career in Cornwall! – I have learnt to like and maybe even love certain aspects of Milton Keynes. Now I think I am proud to call it my hometown. It really gets to me when people bad-mouth Milton Keynes. It is one thing when I, or another long-term resident, berates it a little – which we do, we’re human. But it is something quite different when those that have never lived here, only visited briefly or, in some cases, never been at all bad-mouth MK. It is unfair when people refer to Milton Keynes as concrete jungle or judge it entirely on the central shopping centre. There is an awful lot more to Milton Keynes than that, which is what I hope to prove in this project – The 7 Wonders of Milton Keynes. First, I want to give a little bit of background as to how this idea formed and developed. The title itself came from a conversation I was having with a fellow Milton Keynesian on Twitter. I can’t remember specifically what the conversation was about but I believe it was with @paulmullett. I thought it would make for an interesting blog post or nice design project – maybe a poster series – compiling what I considered to be the 7 Wonders of Milton Keynes. So, I set about short-listing my favourite things in MK. However, this is not something I did alone. I put out word on Twitter of my planned project and got lots of positive feedback and suggestions – so thank you to all those that got involved. Not everything made the final 7 but a lot of things that others suggested I agreed with. So without further ado, these are what I personally feel are the 7 Wonders of Milton Keynes. NOTE: I should point out that throughout this project I refer to Milton Keynes as a town. This is because it is in fact a town. 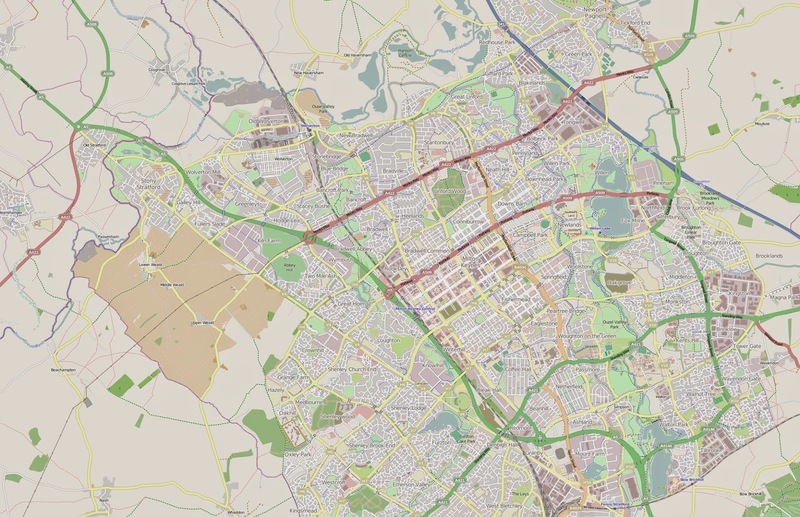 Although residents and visitors alike often refer to Milton Keynes as a city and although its population is over 220,000, Milton Keynes is officially a town. Even despite the town being planned as a ‘new city’, it is still, for now, a town. Other than the infamous sprawl of roundabouts, the Concrete Cows in Bancroft are probably what Milton Keynes is best known for. Well, that and Xscape, an attraction that draws in visitors from all around the UK – not to mention the imposing shape it creates on the Milton Keynes skyline. But the Cows have been here for far longer than Xscape and will probably always remain the symbol of this town. 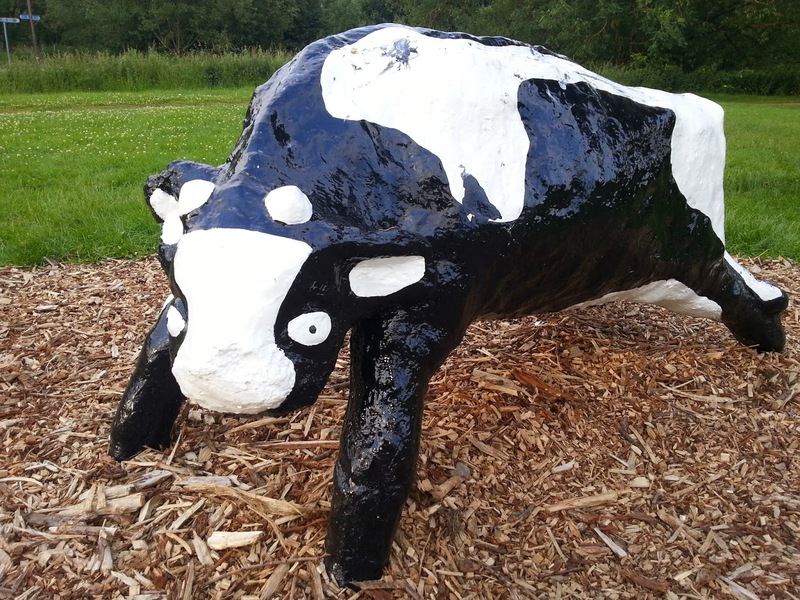 The Concrete Cows were created in 1978 by, artist-in-residence, Liz Leyh using scrap materials, fibre glass and concrete. Some said the Cows were a dig at the preconceived notion of a ‘new city’ that would consist entirely of concrete. And that the children within the city would grow up not knowing what real cows looked like. Of course, that’s ridiculous because there are real farms with real cows less than 2 miles of their concrete counterparts – plus the Cows themselves are located in a real field. Over the years the Cows have not gone unnoticed, they have suffered much graffiti and a little humiliation. However, some graffiti has been more inventive and memorable than mere vandalism. The Cows have been painted pink, reincarnated as zebras and embraced halloween as skeletons. They were also beheaded, Damien Hurst-style, for a short while and one of the calves was once kidnapped and held ransom – but he was safely returned.